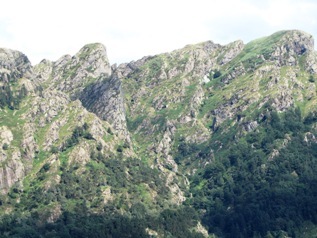 The Arditurri mines nestle beneath the crags of Peñas de Aia/Aiako Harriak, a short distance beyond the village of Oiartzun, in turn just a few kilometres east of Donostia-San Sebastián. 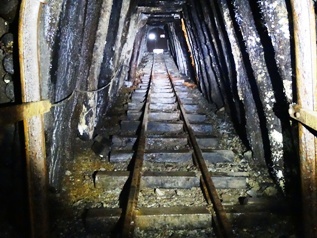 The mines date back to Roman times when silver was mined here. Later, during the Middle Ages, the rich deposits of iron which had hitherto been ignored by the Romans were extracted, the ore being then transformed at foundries westwards along the Oiartzun Valley. At the very beginning of the 20th century, mining was taken over by the Chavarri Hermanos company from Bilbao who, needing to transport the ore to the coast, built a railway line from the mines to the port of Pasaia. Mining activity eventually ceased at Arditurri in 1984, by which time the railway line had long ceased to operate and the tracks torn up. The line has now been transformed into a fantastic cycle track green way known as bidegorri in Basque (literally, “red way” – same concept, different colour!). Recent improvements on the cycle routes leading out of Donostia-Sebastián mean that it is now possible to cycle entirely on inter-connected cycle tracks from the city centre all the way through the outlying neighbourhoods of Gros, Intxaurrondo and Herrera, via the port of Pasaia, Renteria and Oiartzun, to the mines entrance at the base of Peñas de Aia/Aiako Harriak – total cycling time from the Boulevard beside Donostia-San Sebastián’s old part at a fairly leisurely pace is about 1 hour 30 minutes. 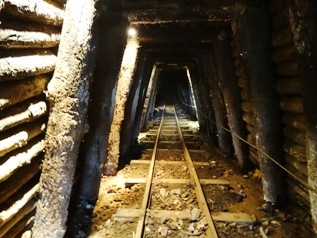 There is now an interesting interpretation centre at the mines which is well worth a visit, and the tours underground of a large restored section of the mines are highly recommended. 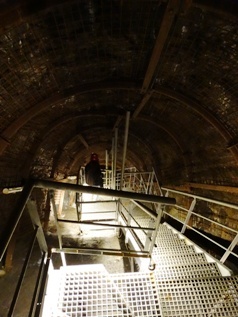 If possible, choose the “Mine in Depth” tour which lasts around 1 hour 15 minutes and includes a fascinating tour of some of the most interesting parts along a safe walkway and series of stairs. Helmets are compulsory and provided by the interpretation centre. A lot of the old machinery can still be seen and all tours need to be booked 24 hours in advance, full details with times and prices being available from the website www.arditurri.com. Apart from the cycle track and the mines, the PR-GI 1009 walking route (waymarked in yellow and white) is a 7.7 km loop starting and ending at the mines entrance which enables further exploration of some open-air mines, old mining buildings, irrigation channels and fine views of Peñas de Aia/Aiako Harriak. The latter can also be climbed from here, although it’s quite a long hard slog of about 700m altitude gain to the first summit, so you need to be in good shape – the views from the top more than compensate for this, however!